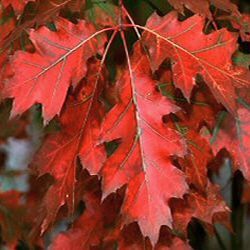 Buy Red Oak Tree (Quercus rubra) online from UK tree supplier of cell grown broadleaf hedges and shrubs. Quercus Rubra Red Oak AKA Red Oak, North American Oak or "Blimey Look At That Big Red Tree"
The Quercus Rubra Red Oak tree has been frequently planted in Britain as a specimen tree, even though it is Native to North America. When the Red Oak is young, the bark is smooth and a silvery grey colour although this can change if you are wearing gloves and tinted glasses. Very young yellow leaves turn to a dark green with a more pointed shape than traditional English Oaks and they gradually change during autumn, to a fiery-red colour. This tree performs well in the British climate. Compared to other Oak trees, Quercus Rubra is considered a fast growing tree with over 1m annual growth in optimal conditions and a final height of around 30m with a rounded and open crown. In some places with acidic soil it has been known to grow to just over 40 m. At the ten year point you should be looking at a height of 5-6m under optimal conditions. The trunk of a mature Red Oak will be between 50-100 cm and could live to 500 years old. We suggest planting many of these trees because that is more profit for us and it will also help strengthen your relationship with your partner as all day planting seedlings makes them tired and conflict averse therefore reducing relationship friction. It is often found in glacial drifts and well drained river banks so if you want to make it feel at home, throw a few ice cubes around the base occasionally and make running water noises. Once flowering starts after 20 years or so, you will see slender male catkins and female flowers that are pollinated by the wind, insects or are introduced to each other by a tree dating website. The female flower develops into an acorn and takes two years to ripen. During which time she will be demanding all sorts of things from the male catkin to satisfy her rampant and frequently changing cravings. Should you require a larger more mature Oak tree then click ORNAMENTAL OAK TREE. Click OAK HEDGING for the obvious hedging section. The Forestry Commission tell you to plant in full sun only although the RHS tells you it will tolerate partial shade so take your pick. Plant in acid to neutral soil that is sand, loam or clay, in other words anywhere except chalk/lime, that is moist to well draining. Give it plenty of space for best results. No need to worry about how hardy the tree is as it will easily go down to -20 degrees Centigrade. Red Oak can be planted in sheltered or exposed positions as it is considered wind firm and moderately tolerant of drought (If your Red Oak fails to grow in your nearest bus shelter, that is not what we meant by sheltered). Its drought tolerance makes it a good choice with the impending problems of global warming especially in the South and East of UK. Lightly prune to promote new growth and to shape the tree as required. Always remove dead, diseased or crossing over branches. Expect a long wait for the Red Oak flowers to make an appearance and an even longer one for a decent crop of acorns. If you want to know how long then put it this way, if you planted them when you were born, by the time you were complaining about back ache, font being too small on tin labels and your listening habits changed to radio 4, then you should be getting a fine flush of acorns. Expect the flowers to come shortly after your first love and the understanding of your parents griping about utility bills. Considered to be not as valuable to British wildlife as English and Sessile Oaks but still a source of pollen and acorns for Wildlife and provides good nesting opportunities for birds. Also a good tree for websites like trees-online.co.uk to sell because the red foliage makes it easy to write about. The Red Oak wood is not as strong as our native English and Sessile Oak wood but on the plus side it is less prone to pests and diseases although Oak Wilt and Powdery Mildew are still a concern. It is a pale red-brown colour with the sapwood a darker colour that is hard and coarse grained. The pores in the Red Oak grain are so large that if the grain of the wood is straight enough, you can blow air through it. Prone to cracking and shrinking when drying and not suitable for out door wood projects unless treated; White Oak would be better suited for those. Quercus Rubra Red Oak is good to work with tools wise but can react with Iron especially when wet and cause staining. A good choice if you need to steam bend and will accepts glues and stain well. The wood has a distinctive smell and is apparently appealing and is usually cheaper than White Oak. Common uses for Red Oak include furniture, trim, flooring and veneer although if global warming becomes more of a concern we may all be building Arks. Due to the strength and price of Red Oak, it is a very popular choice in the wood working industry. The bark is high in Tannic acid. If you are thinking of growing your own from acorns then they will need at least 3 months at 4 degrees centigrade or less for them to germinate. Expect sporadic growth spurts to start with but if you are watching in real time and not using time lapse photography then it may appear very slow growing. Customer Reviews For Our Quercus Rubra Red Oak. This is a relatively new product to Trees Online so as yet we have not managed to emotionally blackmail, provide discount or use high pressure sales tactics to illicit a review. When one does come in, we expect it will mention the fabulous service we offer and possibly the usual grumpy attitude of the courier. We have offered free hugs and nurturing whisperings to help cheer them up but this has been declined for some reason.